Tired of the Hypocrites: Join the discussion! Accountable to God:The Book, discussions have begun inside our new Facebook group page! Many people have received their books and are sharing their thoughts on accountability, God, and our most recent post, Hypocrites in the church. Tired of the Hypocrites is the first chapter in my new book, Accountable to God. Hypocrisy is nothing new, and most people at some point in their lives have been exposed or damaged by it. Make no mistake about it, God has much to say about hypocrites in the church. In my book I share more in-depth, God's heart concerning this and what our response should be. If you are interested in learning more about God, faith, prayers, and your purpose in His plan please join us! If you haven't purchased a copy of Accountable to God you can purchase your copy here on this blog, and I will personally send you an autographed copy! Then, come on over to Facebook I can be found @Authorchandra and in our group AccountabletoGod: The Book. I hear a knock at my hotel room door, and it is a woman with a distinct accent announcing that she is with housekeeping. I am usually gone when they make their rounds. I didn't want to miss her services so I opened the door! As she walks in with continued greetings she says, "I've noticed that you are an Author?" hum, She sounds Dutch, I love that accent! She is very sweet, extremely friendly, and always smiling. I've noticed her before. I didn't have any of my books currently lying around so she says, "I've noticed your books before" and I say, "Yes I am an Author, it is my first book!" The lady congratulated me and said, I noticed it is about God. "Your book will do well here. I see that in the United States many people believe in God, not so in Europe." I could not intelligently respond to that as I have never spent time in Europe. All I could say is, "surely there are a lot of godly people in Europe, perhaps they are more silent?" She says; "No, they aren't silent, they are disappointed. Disappointed in the Religion. Not God." WOW! I did not feel more resolute, in God's reasoning for calling me to write "Accountable to God", than I felt in that moment. I looked at her, and she had a look of disappointment stuck on her face. I said to her, "Do you know that this is what my book is about?" She began to beam, while saying.."It is?" We continued to talk about God. Who God really is, and what He really wants, and how people definitely have a way of convoluting His message. She seemed to be encouraged, and actually left with a copy of the book! I signed it with a message of hope, and asked her to please share it with her family in Europe. Why do you think people are disappointed in Church, thus causing them to be disappointed in God? We have books people, Let's Grow! I am “Officially” a published Author! And it’s time to “Go get it!” When this box arrived I thought, “This just got real!” And I don't say that? I had to really have a talk with myself, because I could feel fear trying to creep in! 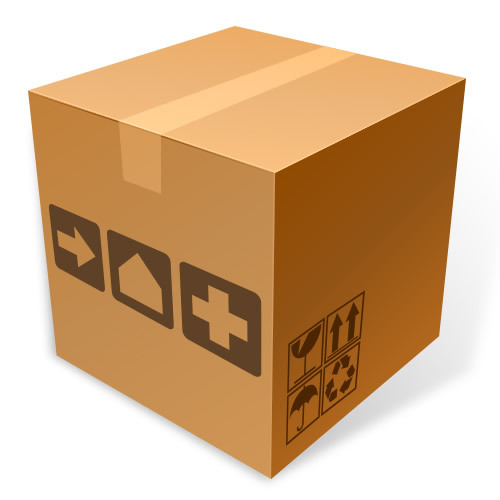 I thought, "Chan, you have a big box of books here, and it's on you to sell all of them." God spoke this book into my spirit, and He would not let it leave. In the past, I had a bad habit of starting and stopping things, but God said not on this one you're not! The Word of God says in Eccl. 7:8, "It's not the beginning of a thing but it's end." What has God trusted you with? What will you be held accountable for? don't have to be afraid of what God has for us. God has already paved the way, and He's waiting on us to take off walking! The circumstances around you don't have to be perfect. If God is in it He will open the doors and anoint you to walk through all of them! God will complete what He has started in you, Phil 1:6. He will reveal His glory in your life! Do you know who you are? Better yet do you know who your God is? My name is Chan, and I am Accountable to God! You can continue to follow this assignment on Facebook, (Chandra Hawthorne), on twitter @AuthorChandra and here on this blog! We've also started a Facebook group entitled AccountabletoGod the book. I'd love to see you in there, Let's start our New Year off right. Let's go! YAAAAAY! 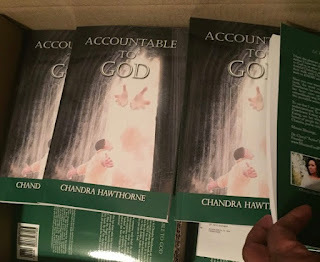 I received an email that my first bulk order of books "Accountable to God" have been shipped! They should be here any day, and I can't wait to share them with you! I am so excited to have this assignment out. When I first began writing this book I never thought about writing it to sell and make a ton of money. This book was birthed out of a burden that God placed on my heart for His people. There is a huge misunderstanding about God, what He wants, and the people who represent Him. Accountable to God will bring so much light into your life. This book during the edits continued to minister and encourage me again and again! It will give you and those you love the faith and hope they need to power forward in life.